Here’s a photo I sneakily took on my camera phone. My book was piled high on the table at Waterstone’s in the Trafford Centre (Manchester). 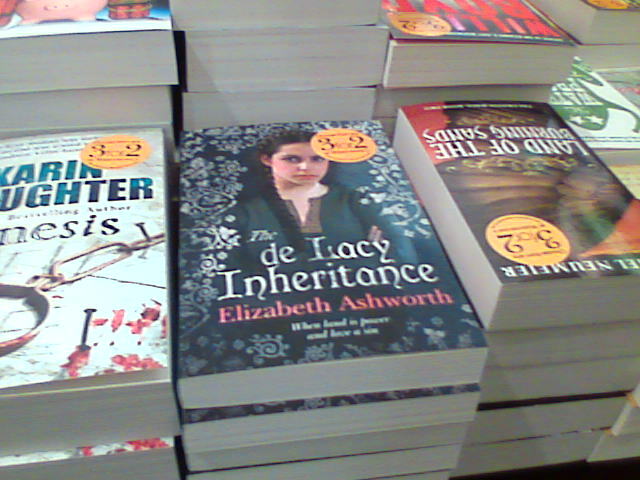 It’s part of Waterstone’s 3 for 2 promotion and I’m so glad they managed not to put the sticker over Johanna’s face! Thanks for taking the trouble to track me down! Enjoy the book and thank you for buying it. Hi Elizabeth, or Libs (because I’m from Litopia – suemont – and I couldn’t find you there to congratulate you). Wonderful, wonderful news. Congratulations – Amazon, here I come, since I can’t get to Waterstones. The book looks great.